It was predictable that Palestine Expo 2017, a celebration of Palestinian culture, art, food, music and politics would, sooner or later, come to the attention of the Zionist movement in this country. 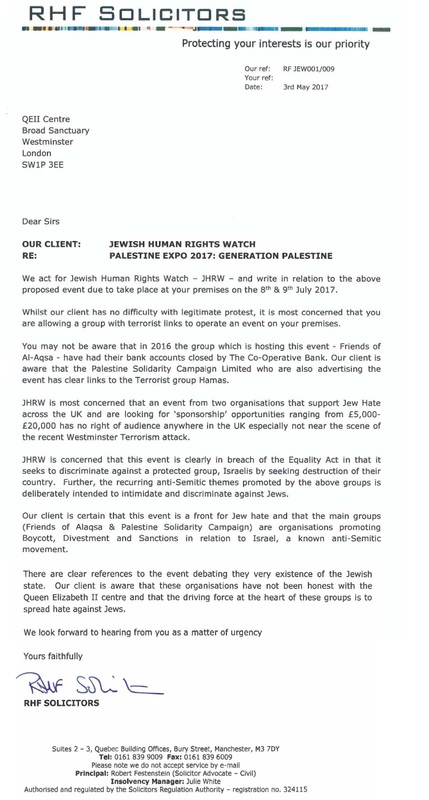 Robert Festenstein of the ‘Jewish Human Rights Watch’ [JHRW] sent a threatening and intimidatory letter to the managers of the Queen Elizabeth II Centre on the South Bank of the Thames alleging that the Conference and the groups behind it are terrorist supporters and that their sole purpose is ‘Jew-hate’. Support for the Palestinians and opposition to Zionism is, according to the Zionist/Israel lobby in this country, automatically ‘anti-Semitic’ and also supporting ‘terrorism’. Thus we seen how the anti-terror climate in this country is being used to try and clamp down on free speech. I have written Festenstein a letter [see bottom of page] by way of response as his letter is a clear abuse of his position as a solicitor and a thinly veiled attempt to use his position as a solicitor in order to try an intimidate the Queen Elizabeth II Centre into calling off a perfectly lawful festival. There is a duty on solicitors under the second principle of the Law Society’s Code of Conduct to act with integrity. There is also a subsidiary principle to ‘behave in a way that maintains the trust the public places in you’. It is clearly the case that Festenstein has done neither. I would encourage people to submit a complaint in writing to the Law Society concerning Festenstein’s deceptive and dishonest conduct. Festenstein and JHRW’s use of the ‘anti-Semitism’ scare is of course par for the course. Anything to do with the Palestinians is, by definition, ‘anti-Semitic’. In Israel the army and police force use force and violence to close down anything they disagree with e.g. 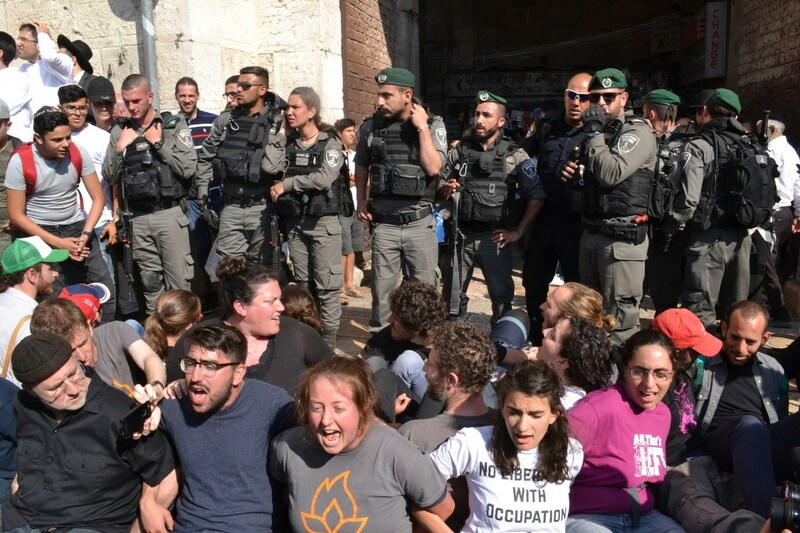 last weekend’s attack on Jewish protesters in Jerusalem who were trying to prevent the normal march of Israeli settler youth through the Arab quarter, replete with their chants of ‘death to the Arabs’. One Jewish woman had her arm broken. 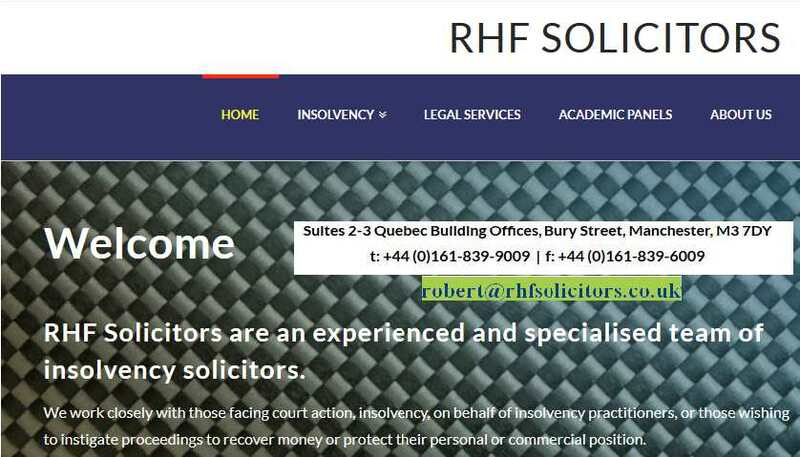 Welcome to RHF Solicitors - not only are they politically bankrupt but their legal expertise is in bankruptcy - even JHRW according to its accounts is bankrupt! It seems that Festenstein has form on these matters. He threatened Cambridge University if it allowed Israel Apartheid Week to go ahead. It even demanded the names of individual students. It also mounted a failed judicial review challenge to 3 local councils for passing pro-Israel motions. Festenstein also wrote threatening legal action to Celtic Football Club and UEFA after fans had greeted an Israeli football club Hapoel Beer Sheva with a mass of Palestinian flags. JHRW on that occasion substituted Nazi flags for Palestinian ones, presumably that was what they wished for. 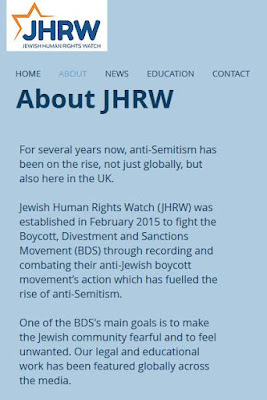 JHRW is an interesting organisation, or rather it isn’t an organisation. It consists of 2 limited companies (presumably so that in the case of failed legal actions or libels, its directors won’t be legally liable). The Directors of Jewish Rights Watch Ltd. - all of whom reside at Festenstein's solicitors' office! The first company, Jewish Rights Watch has four directors. It was founded on 17th December 2014 and its first director, Osker Heiman, was appointed and resigned on the same day. Clearly a man in a hurry. Jonathan Neumann, who is listed by Powerbase, the Public Interest Investigations site as its spokesperson was appointed the same day as Heiman resigned. Emmanuel Manny' Weiss, Robert Henry Festenstein and Joseph Rosenfield were appointed as directors subsequently. 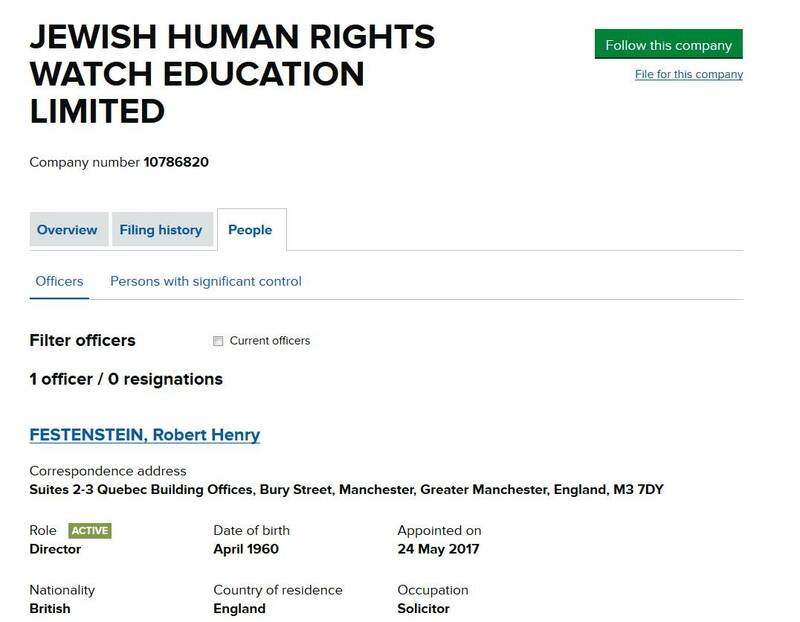 The second company Jewish Human Rights Watch Education Ltd. has just one director, Robert Henry Festenstein! It was formed less than a week ago, 24.5.17. So when Festenstein wrote to QEII on behalf of his ‘clients’ he was lying through his teeth. He was his own client. 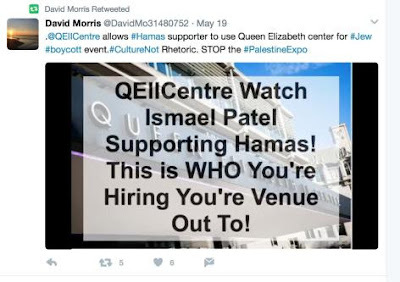 Despite accusing the organisers of Palestine Expo of not informing QEII of who they were, it is in fact Festenstein who was dishonest in not explaining his connection with his ‘client’. Judging by its accounts Jewish Rights Watch owes over £13,000. JHRWE has £100 in share capital, all owned by Festenstein. It is therefore disappointing that the management of the QEII Centre gave these racists the time of day. On JHRW’s web site there is a copy of a letter that the QEII Centre has apparently sent, saying that are carrying out ‘due diligence’ into the organisers of Expo 2017. Instead of putting the organisers under stress and strain they would perhaps better employ their resources into doing a little basic research into the bona fides of bent solicitor Festenstein and his so-called Jewish Human Rights Watch. 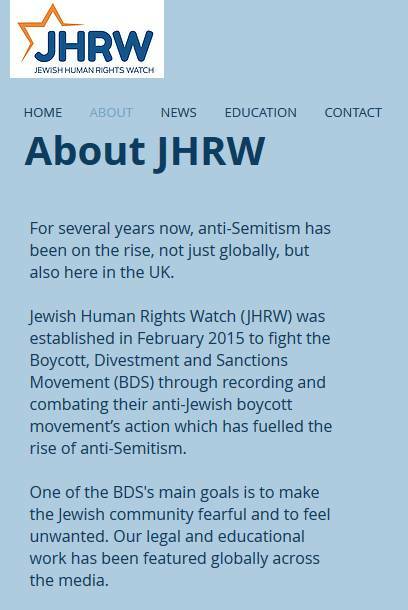 Because the one thing that JHRW is not concerned about is human rights – whether Jewish or Palestinian. An unprecedented hate campaign has been unleashed on the social networks aimed at wrecking a ground-breaking two day event to celebrate Palestinian life and culture. 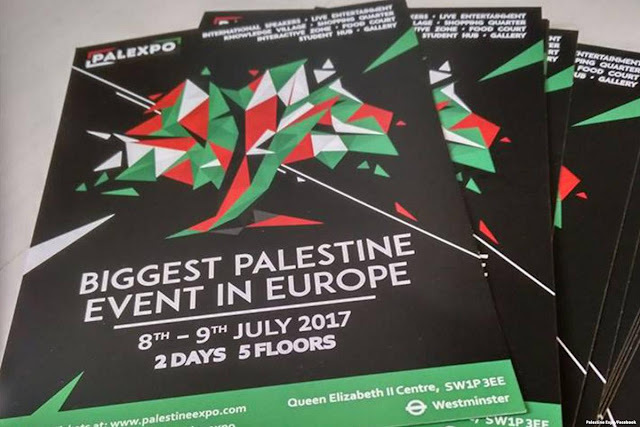 Palestine Expo 2017 is billed as the biggest ever social, cultural and entertainment event of its kind in Europe; however, there are those calling for the festival to be stopped before it even starts. Trading on unfounded fears and using the Westminster and Manchester terrorist attacks as ammunition, some groups and Twitter campaigns have described the expo in London on 8 and 9 July as a “festival of hate”. Others have been more targeted and made potentially defamatory statements, accusing the organisers of having terrorist links in a desperate bid to stop the event — for which thousands of tickets have already been sold — from going ahead. Now lawyers on all sides are examining the accusations and allegations about the event in July, which is designed to celebrate Palestinian culture, art, food and history. 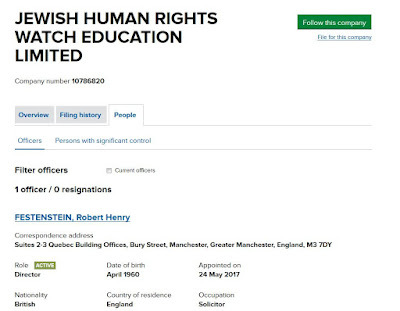 Robert Festenstein of RHF Solicitors in Manchester represents Jewish Human Rights Watch; he has sent a letter to the prestigious Queen Elizabeth II Conference Centre in Westminster urging it not to host the event. The letter makes several damaging allegations against the event’s co-sponsors – Friends of Al-Aqsa and Palestine Solidarity Campaign – both of whom are taking legal advice and vehemently deny the accusations made against them. 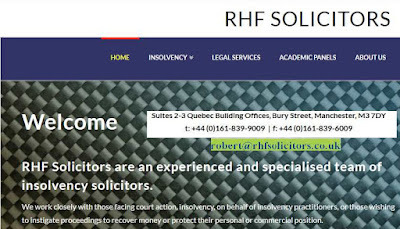 Despite several email requests for a comment, RHF Solicitors have not responded other than to ask, “Can you please confirm how you obtained our Mr Festenstein’s e-mail address? We look forward to your response, following which we will consider your request further.” Subsequent requests have failed to elicit a comment, even after revealing that his email address was obtained via the Law Society website. Friends of Al-Aqsa was established in 1997. 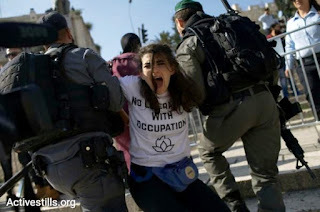 It describes itself as an NGO concerned with defending the human rights of Palestinians and protecting the Noble Sanctuary of Al-Aqsa in Jerusalem. A spokesman declined to comment due to pending “legal issues”. Several of the apparently leading opponents of Palestine Expo who appear to have led the Twitter campaigns against the event have been contacted for a comment. At the time of writing, they have failed to respond to any of the allegations that they have made. 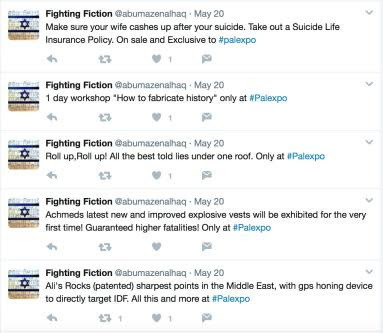 Nonetheless, it is hard to see how the damaging allegations of promoting “Jew Hate” and “Terrorism” could be substantiated when looking at the widely publicised programme at “PalExpo”. This includes exhibitions by internationally acclaimed photojournalist Hamed Abu Rahma and award-winning photographer Rich Wiles. Among the 70 stalls at the event will be examples of fashion, health, beauty, arts, entertainment and food focussing on Palestine and its people. Lively panel discussions, workshops and talks will be on offer while spoken-word performers, musicians and artists will demonstrate how to use creativity and the arts in campaigns and activism. Speakers and performers will include the popular Leanne Mohammed and Muslim Belal, Aamer Rehman and music by the children’s group Fatafeat. Dave Randall, described as a “faithless guitarist and producer” will discuss his book ‘Sound System: The Political Power of Music’. The much-admired Jews for Boycotting Israeli Goods along with Free Speech on Israel will be discussing anti-Semitism. Visitors will be invited to take part in discussions and workshops on Muslim and Jewish experiences in Europe from an academic perspective. More details will follow soon. Palestinian cuisine will also be a major focus with the opportunity to “master the art of Palestinian cooking” at a live, purpose-built kitchen in the food court. The author of ‘Palestine on a Plate’, Joudie Kalla, will make an appearance. Billed as the “perfect space to unleash your inner child” it’s hard to see how the two day event could be viewed as a festival of hate or a terrorist threat. Israel and its supporters seize every opportunity to divert attention from its own human rights abuses and contempt for international law. “If the Manchester attacker was Palestinian and the victims Israeli,” moaned Israeli Prime Minister Benjamin Netanyahu this week, “the terrorist’s family would receive a stipend from Mahmoud Abbas.” It is possible that he used the Manchester atrocity rather cynically as a stick to beat the Palestinian Authority leader because, on Tuesday morning in Ramallah, US President Donald Trump heaped praise on Abbas for being ready to resume peace negotiations with Israel, which Netanyahu is trying to stall. Other Israeli ministers posted tweets very similar to Netanyahu’s suggesting that they were part of a coordinated government campaign to exploit the Manchester tragedy. 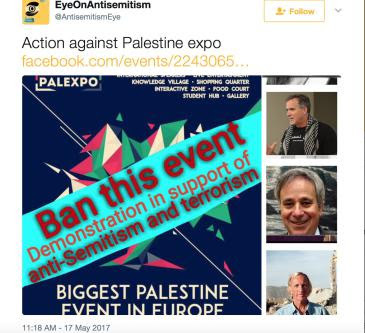 Certainly, a similar coordinated effort to have the Palestine Expo stopped before it even starts can be evidenced by doing a quick search on the social networks, although there is no suggestion this is being organised or instigated by JHRW or its lawyers. Nevertheless, it is difficult not to conclude that the pro-Israel lobby swings into action to trash the reputations of Palestinians and those who support their struggle for their legal and human rights every time that something positive about Palestine emerges which will expose the Zionist narrative for what it is. Indeed, Robert Festenstein and his chums have a bit of a track record on this already. Some of their activities were exposed by my colleague Ben White on these pages in March last year. Interestingly, in his mini-campaign to get Hewitt banned from Manchester the lawyer said nothing about a talk that he was due to give just a few days after the Interpal event, in the same venue, for a British advocacy organisation. Mr Festenstein’s “concern”, it would appear, wasn’t so much about stopping “peddlers of hatred” as he claimed, but more of an attempt to damage an event at which funds would be raised by a British charity to help Palestinians in desperate need. 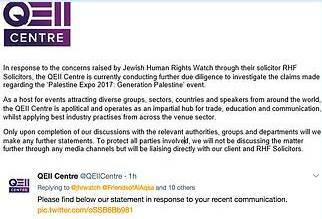 The management of the QEII Conference Centre also failed to respond to MEMO enquiries on Thursday, although it is understood that it has carried out extensive due diligence checks regarding the allegations contained in the JHRW lawyer’s letter, and is content to allow Palestine Expo 2017 to proceed. Having trawled extensively through the social networks and the programme lined up at the expo, a reasonable person has to conclude that there is indeed a hate fest in progress, but it’s certainly not organised by Palestinians or their growing network of supporters from various faith communities and among those of no faith. Far from promoting hate, Palestine Expo 2017 promises a celebration of culture, arts, crafts, food and music promoting the country and its people in a positive light. Who wouldn’t support that? Only those with no grasp of great British values such as democracy, justice and mutual respect and tolerance of others, that’s who.